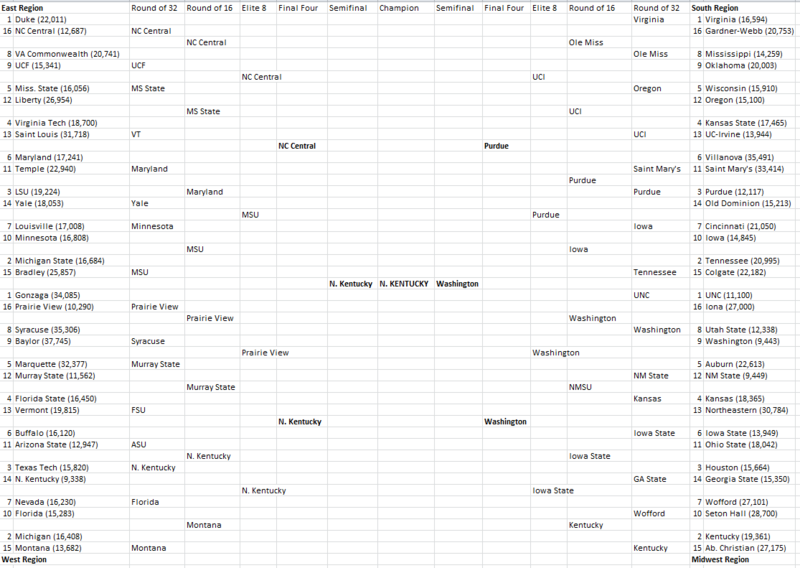 Every year, I take the 68 teams in the NCAA Division I men’s basketball tournament and fill out a bracket based on colleges with the lowest net price of attendance (defined as the total cost of attendance less all grant aid received). My 2017, 2016, 2015, 2014 and 2013 brackets are preserved for posterity—and often aren’t terribly successful on the hardwood. 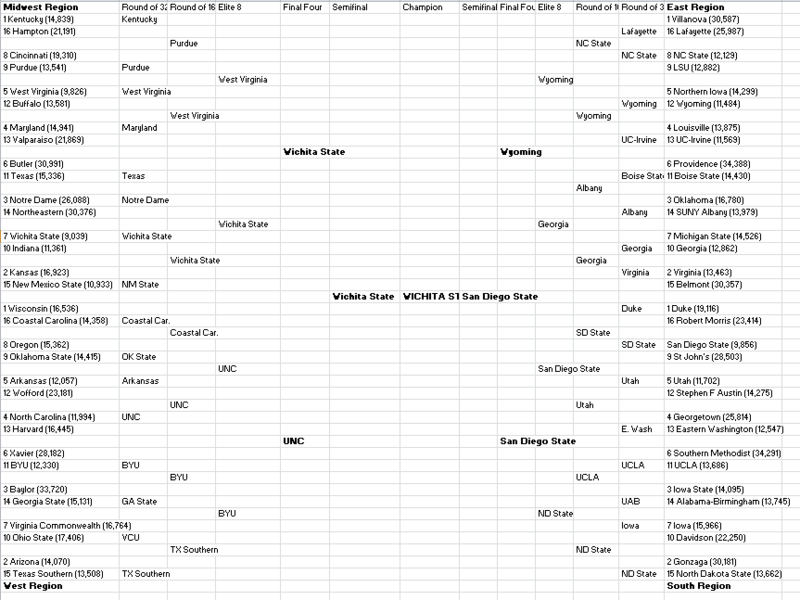 My 2015 winner (Wichita State) won two games in the tournament, while prior winners New Orleans (2017), Fresno State (2016), Louisiana-Lafayette (2014), and North Carolina A&T (2013) emerged victorious for having the lowest net price but failed to win a single game. But at least West Virginia (a regional champion last year) won two games, so maybe there is some hope for this method. 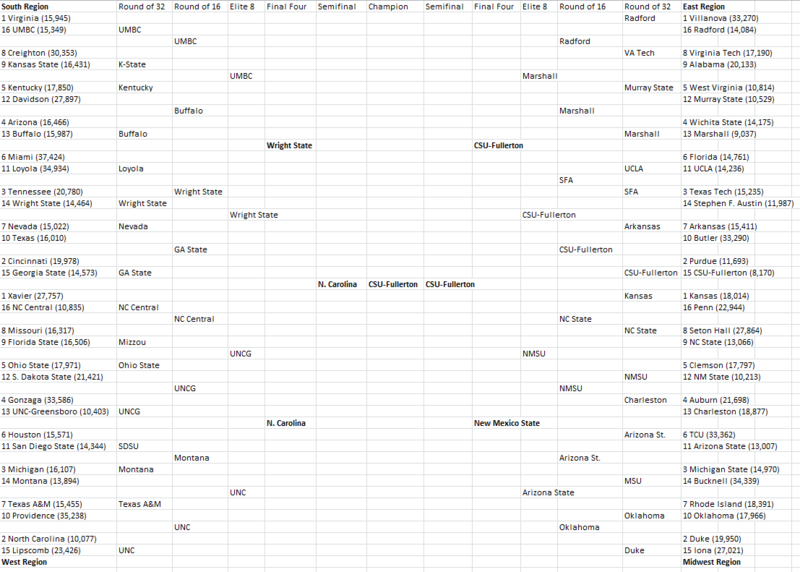 I created a bracket using 2015-16 data (the most recent available through the U.S. Department of Education for the net price of attendance for all first-time, full-time students receiving grant aid I should note that these net price measures are far from perfect—the data are now three years old and colleges can manipulate these numbers through the living allowance portion of the cost of attendance. Nevertheless, they provide some insights regarding college affordability—and they may not be a bad way to pick that tossup 8/9 game that you’ll probably get wrong anyway. Additionally, although I didn’t do a bracket for students in the lowest family income category (below $30,000) this year, the University of Michigan has the lowest net price in that category (at $2,660). Although Michigan doesn’t serve that many low-income students, a new program (designed in part by all-star Michigan economist Susan Dynarski) guarantees four years of free tuition for in-state students with family incomes below $65,000. That’s a good step for a wealthy public university to take. As someone who spends a lot of time thinking about some of the wonkier issues of higher education finance, there are some common statements that just drive me nuts. For example, people who refer to the U.S. Department of Education as the “DOE” (it’s “ED” and the Department of Energy is “DOE”) or pronounce the FAFSA as “FASFA” might as well be screeching their fingernails on a chalkboard. But, as much as those things annoy me, they’re examples of inside baseball at their finest—they don’t affect students, but they’re still deviations from the norm. So I’ll try to hide my grimaces in those situations going forward. Price: This represents how much money a student and/or their family has to pay for college. Cost: This represents how much money it takes to provide an education. With the presence of federal, state, and institutional financial aid as well as direct state appropriations to colleges, the price that many students pay can be far below the true cost of providing the education. On the other hand, due to the tangled web of subsidies present in the “awkward economics” of higher education, some students (such as full-freight international students and master’s students as well as those enrolled in large lecture classes) may be paying far more than it costs to provide their education. From a policymaker’s perspective, it if far easier to propose bringing down the price of college than the cost of college—even though these proposals have large price tags and finding funding can be difficult. (An exception is so-called “last dollar” programs at community colleges, which often leverage other grant aid sources instead of using much of their own money.) Bending the cost curve is a far more difficult endeavor, as technology generally hasn’t done much to reduce costs (a promising master’s degree program at Georgia Tech notwithstanding) and other options such as increasing class sizes or spending less on facilities frequently run into opposition. Efforts to bring down the price of college have become increasingly popular over the last several years, but they must be accompanied with a willingness to reduce costs in order for these programs to be financially feasible in the long run. To this point, cost control has remained a distant goal for most policymakers—a perfectly reasonable position given the shorter time horizons of most politicians. Bringing down prices today gets attention, while the crucial step of bringing down costs in the future is nowhere near as exciting. Colleges’ net prices, which the U.S. Department of Education defines as the total cost of attendance (tuition and fees, room and board, books and supplies, and other living expenses) less all grant and scholarship aid, have received a lot of attention in the last few years. All colleges are required by the Higher Education Opportunity Act to have a net price calculator on their website, where students can get an estimate of their net price by inputting financial and academic information. Net prices are also used for accountability purposes, including in the Washington Monthly college rankings that I compile, and are likely to be included in the Obama Administration’s Postsecondary Institution Ratings System (PIRS) that could be released in the next several weeks. Two recently released reports have looked at the net price of attendance, but only one of them is useful to either researchers or families considering colleges. A new Brookings working paper by Phillip Levine makes a good contribution to the net price discussion by making a case for using the median net price (instead of the average) for both consumer information and accountability purposes. He uses data from Wellesley College’s net price calculator to show that the median low-income student faces a net price well below the listed average net price. The reason why the average is higher than the median at Wellesley is because a small number of low-income students pay a high net price, while a much larger number of students pay a relatively low price. The outlying values for a small number of students bring up the average value. 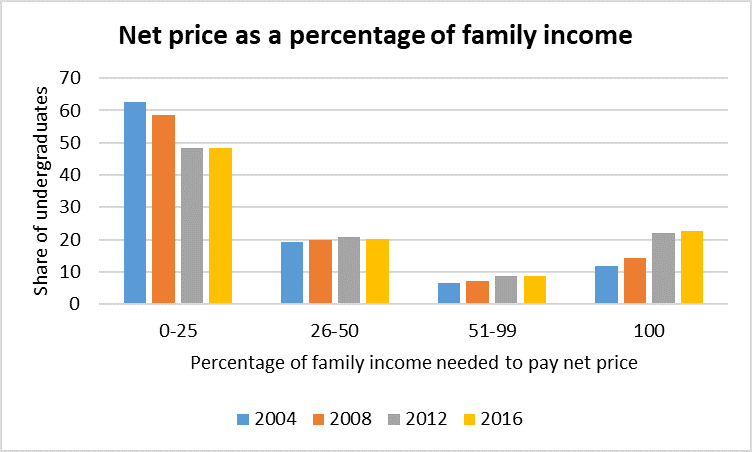 Comparing average and median net prices by family income quartile. SOURCE: National Postsecondary Student Aid Study 2011-12. 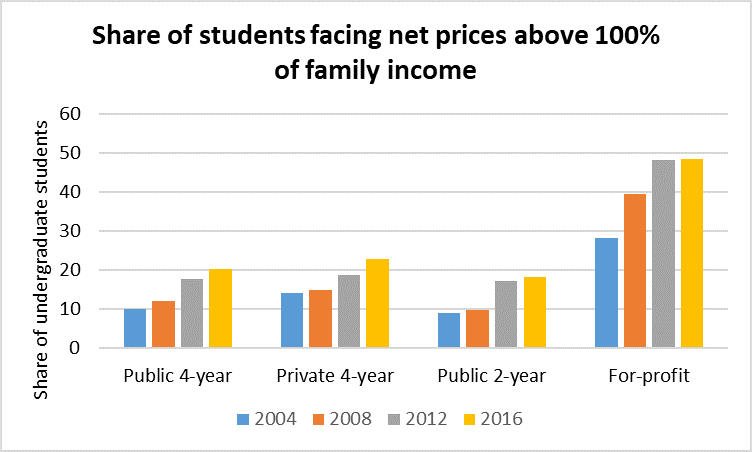 Across all family income quartiles for both dependent and independent students, the average net price is higher than the median net price. About 60% of students pay a net price at or below the average net price reported to IPEDS, suggesting that switching to reporting the median net price might improve the quality of available information. (1) “Net price” doesn’t include all cost of attendance components. They publicize a “net tuition” measure and a “net tuition, fees, room and board” measure, but the cost of attendance also includes books and supplies as well as other living expenses such as transportation, personal care, and a small entertainment allowance. (For more on living costs, see this new working paper on living costs I’ve got out with Braden Hosch of Stony Brook and Sara Goldrick-Rab of Wisconsin.) This understates what students and their families should actually expect to pay for college, although living costs can vary across individuals. (2) Tax credits are included with grant aid in their “net price” definition. Students and their families do not receive the tax credit until they file their taxes in the following year, meaning that costs incurred in August may be partially reimbursed the following spring. That does little to help families pay for college upfront, when the money is actually needed. Additionally, not all families that qualify for education tax credits actually claim them. In this New America Foundation blog post, Stephen Burd notes that about 25% of families don’t claim tax credits—and this takeup rate is likely lower among lower-income families. Sadly, the College Board report has gotten a lot of attention in spite of its inaccurate net price definitions. I would like to see a robust discussion about the important Brookings paper and how we can work to improve net price data—with the correct definition used.